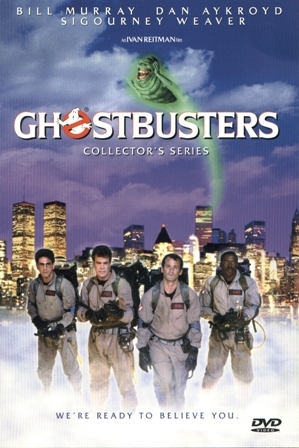 The movie is about three people who work together and fight ghosts in New York City. And as they get more famous and face bigger ghosts, they get a new Ghostbuster to help them. The city is about to be destroyed when a business person (Dr. Peck) sets free all the ghosts and they attack the city. Dr. Peck wants Dr. Venkman arrested. Now it’s up to the Ghostbusters to save the city. My favorite part of the movie is when the Stay-Puft Marshmallow Man comes because I think it is funny a big marshmallow person comes to attack the Ghostbusters. My favorite character is Dr. Raymond Stantz, played by Dan Aykroyd because he is a funny Ghostbuster. I think it is funny when he picks the Stay-Puft Marshmallow Man to destroy them. TRIVIA: There will be a Ghostbusters 3 movie in 2012. This movie should definitely be rated PG. I think it’s appropriate for some kids, ages 7.5 and up. Warning it has some bad words throughout. Some scary parts with monsters and some violence and kissing. MPAA Rating: PG. Some material may not be suitable for children. Profanity and some scary moments. See my brother’s review here. I like when they talk funny–the keymaster and doormaster. It’s very funny and weird. And I like the songs. I agree with Dylan–I do think that the marshmallow man is funny! And I love the movie Ghostbusters! The idea that Dylan thought–he wants to watch ghostbusters and eat marshmallows, jello and hot chocolate–is a really good idea! I said I would ask my mom. My mom said we could and she is thinking of a day. Maybe a Friday?